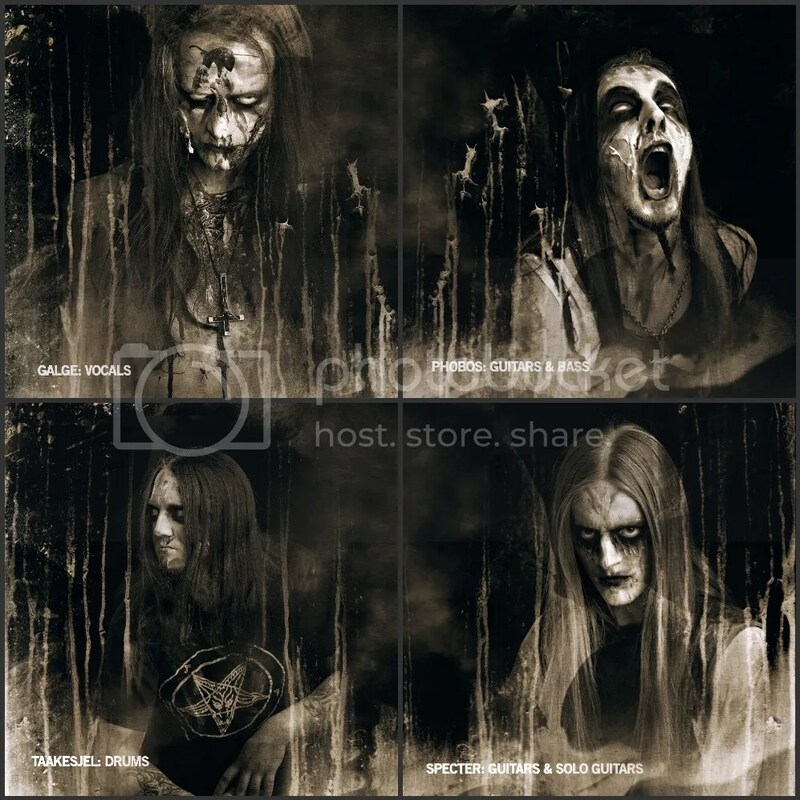 Formed in 2005 by guitarist Phobos (AETERNUS, MALSAIN, GALAR) and drummer Taakesjel (BIZARREKULT), GRAVDAL is a Black Metal band firmly rooted in Norway’s legendary Bergen Scene. A scene that over the years has spawned such seminal bands as GOROGOROTH, ENSLAVED, IMMORTAL and TRELLDOM – to name but a few. Starting out initially with the idea of remaining a studio band, GRAVDAL recruited vocalist Galge and recorded the first demo, “Massegrav” in 2005. However, shortly after the release of “Massegrav, it became obvious to the members that they wanted more from their music, and so a full line up was established with the addition of Specter (AETERNUS, GALAR) on guitars and Daud on bass. Specter and Phobos began composing music together and with a now solid line up GRAVDAL hit the stage for the first time in 2006, and have since played with bands like TAAKE and DERIDE, and recently supported GORGOROTH on their European tour and have played at both the Inferno and Hole in the Sky Festivals. With their debut album “Sadist” mixed and mastered by ENSLAVED’s Herbrand Larsen at the Conclave and Earshot Studios in Bergen, GRAVDAL inked a deal with Sweden’s Unexploded Records, and “Sadist” was released in 2008 to great reviews in the metal press world-wide. The 2010 release of the band’s sophomore album “Torturmantra” revealed the band’s new-found maturity in terms of both material and performance, and a guest appearance by SHINING’s Niklas Kvarforth confirmed GRAVDAL’s ability to surprise and innovate, whilst still remaining solidly grounded in the Black Metal Genre. The album was once again recorded at the Conclave and Earshot Studios, with Herbrand Larsen being joined by VULTURE INDUSTRIES’s Bjornar E. Nilsen at the production helm. That Niklas Kvarforth should then go on to select the track “Mishandlet” for inclusion on his a solo project “Fifteen Years of Absolute Darkness” which charts fifteen years of his often controversial musical career further re-enforced GRAVDAL’s reputation. So what should you expect from GRAVDAL? Well, the band performs “in your face” Black Metal; with lyrics that take as their theme the tragedy of a weak-willed humanity, and the despair into which it sinks due to its conceited misconceptions. GRAVDAL performing the tracks “Mishandlet” with SHINING’s Niklas Kvarforth on guest vocals, and “Hyrdestund I Helvete” live at the Memorial Concert for SLAVIA’s Jonas R Christiansen at the Garage, Bergen, 18 Nov 2011 (fan-filmed footage).